There are tournaments at the Soccer Palace in West Orange and Westfield nearly every weekend. More information can be found HERE. F.C. 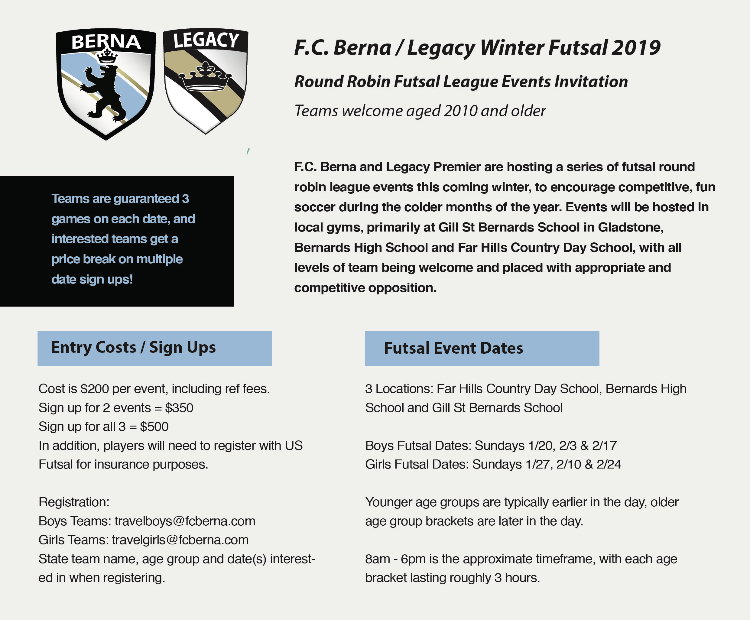 Berna and Legacy Premier are hosting a series of futsal round robin tournaments this coming winter, to encourage competitive, fun soccer during the colder months of the year. All tournaments will be hosted at Far Hills Country Day School and Gill St. Bernards, with all levels of team being welcome and placed with appropriate and competitive opposition. Teams are guaranteed 3 games on each tournament date, and interested teams get a price break on multiple tournament sign ups! Please contact Brian Finn at brianfinn4@verizon.net with any questions. Hope to see you there!